I am well aware that my posting has been scarce lately. Mom came out for a 10 day visit which was fabulous! Life just seems a little easier when she is there. She really got my yard in shape since I have a combination of lack of motivation and fear of snakes stopping me. Once she has it in shape I can maintain it just fine, but getting it to that point is something I can’t seem to bring myself to do. She was saying that we should have taken before and after pictures, which I wholeheartedly agree with! I took Mom to the airport on Friday afternoon then returned to work. And then the excitement started! I generally stay until 5 PM. Around 4:45 my boss, who lives just down the street from me, came into the office and hurriedly said “The tornado sirens are going off and there is a big storm to the north of us, I don’t know about you but I like to get my daughter and get home when this happens, you are free to go too if you like.” Well, I always like to leave early, and I like even better to be home when it storms. Do you see where this is going? Should I trademark the “I’ll just beat the storm” concept? Because I always try it! I run out of the office, run up to her school where she is already safely in the shelter with the other children, take her from the shelter all the while saying “Bug, now would be a really good time to listen to mommy and hurry!” while she obeyed perfectly with the background noise of tornado sirens. We got home and I opened the car door to the first of the rain. We got inside, I turned on the TV to see what was going on and started to shut windows. At this time the wind was picking up and whooshing the tree’s around in a disturbing way. The weatherman kept saying that this wasn’t a tornado but more like a hurricane with 100 MPH winds. We didn’t even manage to get in the basement before it hit. The winds were insane and it dropped golf ball sized hail. The power flickered on and off, on and off until finally the weatherman was no more and we were left to our own devices. I held Bug with her face to my chest under the arch between the living and dining room while she attempted to control her panic. The whole thing was surreal and it happened so fast! I think it was probably as fast as a tornado, it was there and then gone before we could comprehend what was going on. And behind the wind and the hail was a rain storm that just pounded us. I watched this out my front window. The street in front of me turned into a river in which massive tree branches floated out toward the main road. My sun curtain on my porch was shredded, and all the porch furniture was gone. And then it was done! The sky brightened and the cold front came through and all was clear. The river in the road dissipated and we were left to survey the mess. I grabbed a broom and got my shoes on. What I really needed was a shovel for the front porch. It was plastered with leaves and shreds of the sunshade. I swept it all into a big pile, hung up the rug, and retrieved my porch furniture which had migrated to my lawn. Bug just kept saying “What a MESS! What a MESS!” and she was right. She thought playing in the piles of hail was such fun though, I mean ice, on the ground, in the summer??!! This has to be every child’s dream! My neighbor came out to tell me that she saw my garbage can float down the river that was our road and figured hers had gone the same way, so we began to trek out to the main road to bring them back. Indeed they made it all the way out onto the main drag. On this trek we began to see how extensive the damage was. I would say at least every other house had either large branches down or entire trees uprooted. I live in a historic district so the trees there are mature and beautiful but also dangerously large. Fences were pulled out and scattered about as well was every yard item you can imagine. As we walked we returned the items if we knew where they belonged, and pulled the largest of the branches out of the road and onto the side. At this point I was still hopeful that we might get our power back, as the city seems to be pretty good at keeping on top of things. Then we meandered in the other direction. I realized that the ONLY way to get out of our area, the only entrance and road clear of a full tree across it, was the way we just wandered. And in the trees that were down we could see messy tangled power lines. It was then I realized that it might be awhile. We got in the car to turn the radio on and listen. I realized that the entire city had been hit and it was safe to say that most were without power. I tried to make phone calls but of course the networks were too busy. In the end, we didn’t get power back until last evening. And from surveying the damage I would say the city did a wonderful job, as I expected almost a full week. I have never joined a swap before. I have never bought yarn for someone else and sent it off in order to receive something else sight unseen. It sounds scary to me, and then to top it off I have heard various horror stories about what people received or perhaps they received nothing at all from a swap partner. Part of the reasoning is that I feel that I might BE the bad swap partner. What if what I send is not good enough? I don’t like that thought at all. Then when I read about Hush Hush Handspun Hootinany I realized this was a swap I could get behind! The deal is that we send 4oz. spun fiber and 4 oz. roving to our partner. This sounds right up my alley so I jumped on board with very little hesitation. Now I need to blog a questionnaire about myself for the person who will be sending to me. Here goes nothing! I have been spinning for about 8 months now. It came easy to me. I would consider myself intermediate to advanced in basic spinning, but have not tried techniques such as long draw or any type of art yarns. I’ve done some singles. Most of what I spin is 2-ply sock yarn. I have done quite a bit of navajo plying as well, since I think it is downright enjoyable. I have never spun art yarn nor have I done traditional 3 ply. I’ve never knit socks with my sock yarn either! I have a majacraft rose. I invested in her after buying a second hand ashford kiwi and falling in love with spinning. (And spinning fell in love with me!) I do not have my own spindle, and had never used one prior to purchasing my wheel. I did learn to spindle spin for a public speaking demonstration, and I enjoyed it quite a bit. 4. What are your favorite fibers to spin with? Anything you don’t like? I like merino and merino blends very much. Spinning with silk is like a dream. 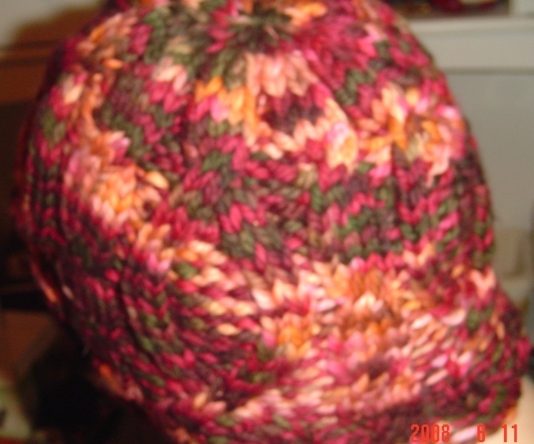 I love slippery fibers and tend not to like the rougher wools very much. I also do not particularly like BFL. I cannot tell you why, and I know you will all think I am strange, but I have just not had the best of luck with it. This could, in part, be that I received low quality BFL or poorly prepared BFL, but at this point I might have a mind set against it. I have gotten most of my fiber from The Loopy Ewe but am perfectly willing to try something new. I’ve always wanted to try some non blended silk or bamboo. I have also not tried many different wools other than merino, coopworth, and BFL. 7. Is there any techniques you would like to learn? I’ve not done a traditional 3 ply yet, and I would like to get better with my laceweight. I have done some koolaid dyeing and have ambitions to dye my own fiber but they have not yet been realized. I have a pair of hand cards which have never been used. I just purchased them for some angora I was given. I cannot say if I will enjoy the process or not but I do believe I would prefer prepared fiber. Is it OK to say none here? Well that might not be entirely true. I did complete a pair of socks for my daughter out of my second handspun ever. I also completed a print o’the wave shawl out of my third handspun. 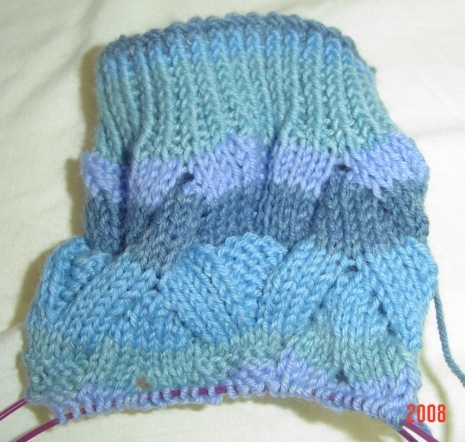 I’d really like to make socks and lace out of handspun but have not done so yet. Heck yeah, I don’t have anything like that! 12. What colors “fall into your shopping basket”? Any colors you just can’t stand? I love color! I want to be thinking out of the box on this one. I do not have colors which I do not like so I am safe with someone picking for me! I have 8 oz Blue Moon Fiber Arts merino in Ravenscroft colorway. I am completely in love with this fiber. It is prepared so nicely and drafts like a dream. I wanted something very subtle for socks for my dear friend Nick and this just seemed to work perfectly. The added advantage is that there will be enough for 2 pair! Well knitting of course, which is a bigger obsession for me than spinning. I enjoy reading and listening to audio books. I’d like to travel one day but for now my travels are kept within a small radius of my home. I love cooking Mediterranean food. I enjoy biking in the warmer weather. Why do I now feel like I am filling out a personal add? I love to learn about different cultures. I tend to lean toward crunchy hippie gal who dreams of her own organic gardens even though I don’t appear it on the outside. I have a Loopy Ewe wish list. Besides stash? Not so much. I have an interweave knits subscription. 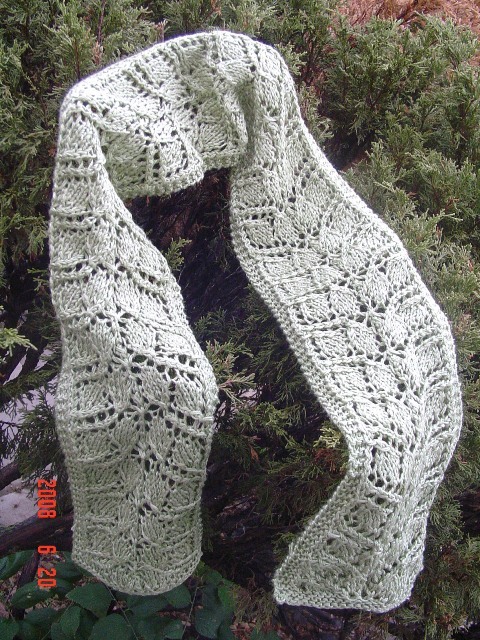 I am jonesing for both “A Gathering of Lace” and “Victorian Lace Today.” I work with only bamboo or wood needles. I would someday like the be in the presence of both Wollmeise and Numma Numma yarn. Me and thousands of others I suppose! Did you see Julia Roberts in Runaway Bride? Totally me! Didn’t I just do that with the Runaway Bride comment? OK OK, let’s try something else. I love process cooking. For instance, I make my own yogurt and whole wheat bread. Next on the list to learn is cheese. You will never see my home lacking in homemade yogurt. It just never happens. Or how about the fact that I do not like ice cream? That usually gets me some stares. Candy: I like dark chocolate. I really don’t like many other candies. Food: I love hummus, tabbouleh, genuine falafel, lebnah, there are few middle eastern and Mediterranean foods I don’t like. I actually can’t think of any. I am also crazy for kraft 3 cheese mac and cheese, and I am not sure why. They must put something addicting in that stuff! Drink: Well, I drink a lot of water, distilled water. I have always thought that water is the best tasting drink out there. Barring that I might have some nice dark coffee in various flavors or jasmine green tea. Also wine, I do like a nice glass of wine every once in awhile. TV Show(s): There hasn’t been much that has captured my attention lately. I loved “Heroes” but the hiatus has been too long. “Lost” has lost me, much to my chagrin. I have been watching “Dr. Who” in dvd lately. Guilty Pleasure(s): Fine dark chocolates. Also cheese. I am crazy over fine cheese. 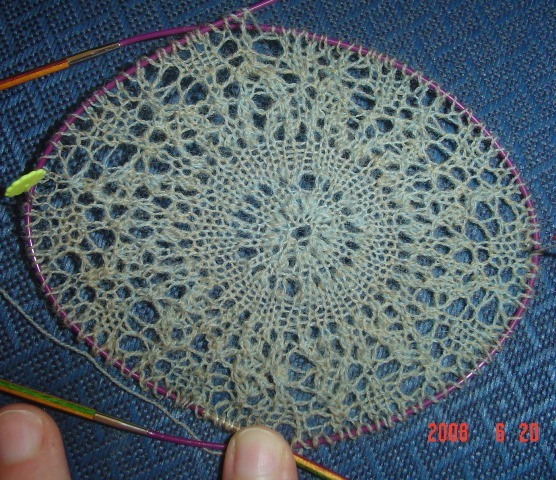 I think I can say that lace knitted in the round is equally as awesome as lace knitted any other way. I chose chart C for this one, though D looked very tempting as well. Now that the latest branching out scarf is done, we can get back to working on a few other ongoing projects. And add a few new ones! I’ve joined the Goddess Knits anniversary shawl knit along. 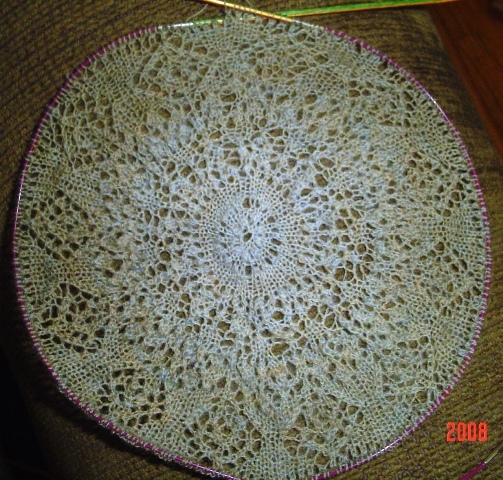 This is a round shawl with a mandala theme. What I am enjoying the most about it is that the designer is giving us chart choices, so every shawl will look a bit different. I am using jojoland harmony yarn which borders on a cobweb weight. It was quite a challenge to start it, but I am getting a bit more used to it now. This picture is through clue one. I have also started on a pair of Monkeys for a cousin whom I will see in August. I am working on them as my work project and feel fairly confident they be done by then. Done again in Handmaiden Seasilk held double stranded throughout. This one is a solid color which really features the pattern of the lace. I love it! I have just listed 2 more handspun yarns on my etsy site. Wicked and Alien Baby. I have to admit even though the colors were way out of my comfort zone, I had a serious obsession with them, and spinning them was a blast! The color saturation is wonderful and the silk makes spinning this an absolute dream. I can imagine Alien Baby made into socks with alternating black strips. I’d do it myself but I just can’t find the time! All we are doing tonight is going up and down the basement stairs. Tornado sirens stop and we come up just to get settled and hear them again. Ridiculous. Nothing is getting done tonight and I have more than enough to do! Today at work I finished another cable hat. This poor picture is of the back of my head. You’ll just have to take my word for it that it is cute!